Vinton Gray "Vint" Cerf (Born June 23, 1943) is an American computer scientist who is the "person most often called 'the father of the Internet’. 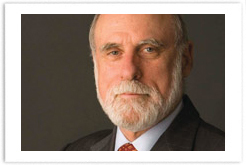 His contributions have been recognized repeatedly, with honorary degrees and awards that include the National Medal of Technology, the Turing Award, and the Presidential Medal of Freedom. 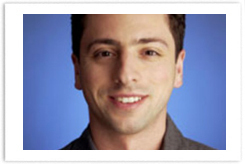 Cerf has worked for Google as its Vice President and Chief Internet Evangelist since September 2005. In this role he has become well known for his predictions on how technology will affect future society, encompassing such areas as artificial intelligence, environmentalism, the advent of IPV6 and its delivery model. 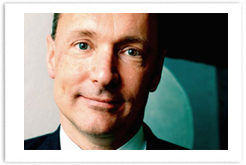 More..
Sir Timothy John Berners-Lee (born 8 June 1955) is an English computer scientist credited with inventing the World Wide Web. On 25 December 1990 he implemented the first successful communication between an HTTP client and server via the Internet with the help of Robert Cailliau and a young student staff at CERN. He was ranked Joint First alongside Albert Hofmann in The Telegraph's list of 100 greatest living geniuses. Berners-Lee is the director of the World Wide Web Consortium (W3C), which oversees the Web's continued development, the founder of the World Wide Web Foundation and he is a senior researcher and holder of the 3Com . More..
Sergey Mikhailovich Brin was born in Moscow , in the Soviet Union to a Jewish family, the son of Mikhail Brin and Evgenia Brin (Krasnokutskaya), both mathematicians who graduated from the Moscow State University. In 1979, when Brin was six, his family emigrated to the United States . Brin attended grade school at Paint Branch Montessori School in Adelphi , Maryland , but he received further education at home; his father, a professor in the department of mathematics at the University of Maryland, nurtured his interest in mathematics and his family helped him retain his Russian-language skills. In September 1990, after having attended Eleanor Roosevelt , More..
Lawrence Edward "Larry" Page (born March 26, 1973) is an American entrepreneur who co-founded the Google web search engine, now Google Inc., with Sergey Brin.Larry Page is the son of the late Dr. Carl Victor Page, a professor of computer science and artificial intelligence at Michigan State University and one of the University of Michigan 's first computer science Ph.D. graduates, and Gloria Page, a computer programming teacher at Michigan State University . Despite his mother being Jewish, Page was raised similarly to his father: without a religion. 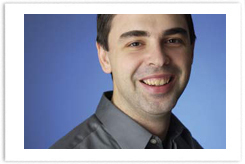 He is also the brother of Carl Victor Page, Jr., a co-founder of eGroups, later sold to Yahoo! More..
Oyya-Info recommends Internet Explorer 7 or Firefox 3 with 1024x 768 resolution (and above) for optimal performance. Copyright © Oyya-Info. All Rights Reserved.